being such a wonderful source of inspiration! I've had this page up for a few years now. I know lots of people visit which is nice. Please do drop me a note if you found something here helpful. That way I'll know there's a point in adding material. Enjoy! A few years ago I finally got into cooking and baking. I thought I'd share some of my finds here. Some are just links, but they're tried resources, and in addition, I also include a few of recipes passed down from my Mom to me and now to you. She even has a cookbook out on Hungarian cooking (in English) if you'd like more related resources. If you'd like to print out a recipe on this page, you have the option of a printer-friendly version so you don't waste paper and can get it all on one page. Click on "printer-friendly version" in the window of the recipe for this option. If you use any of these recipes, I'd love to hear from you! Send me a note at recipes04 at eszter dot com. Please send a note to the same address if you'd like to receive a notice when new recipes are added to the page. Enjoy! Chicken paprikash - H > Thanks to my Mom for all of these! Voila, that's it. Very easy and VERY yummy. Cucumbers - they shrink a lot so use at least three or four for 2-4 people. Prepare while preparing other dishes, must sit for half an hour. There is some guessing involved in the amounts used. Slice up the cucumbers into thin slices.. using a grater is best (just slices, not strips). Put into a bowl and add lots of salt (two/three teaspoons). Mix thoroughly with hands. Let sit for half an hour (or more is not a problem). Next, squeeze with hands to rinse out. Taste and if too salty, run some water on it and rinse again. Take the garlic, chop it up (best to press actually) and mix it in with the cucumbers. Now take some vinegar (about two tablespoons) and add. Add some (1 teaspoon) sugar as well. Mix. Then take some sour cream (two tablespoons), mix to smooth and then add to salad. Before serving, add some red paprika on top for decor. Cut big onion into small pieces. Cook in small pan using some oil until clear (make sure not to burn it!). Cut chicken into pieces about 3x2 inches. Put oil in the big pan and cook both sides of the chicken pieces. At first, only put so many that they make one layer in the pan. Take out, put in next batch. Once all have been cooked on both sides (white but not brown) then put them all in the pan. Put the onions on top of the chicken pile and add salt plus the paprika. Add 1/2 cup water. Set heat to medium-low. Keep an eye on the dish. The chicken can lose lots of water. You don't want the whole pan to be filled with water because that will give the chicken a different flavor. Periodically, drain the pan of some water. DO NOT DUMP this liquid, rather, collect it in a mug. This will be very important and delicious sauce in the end that you will pour over the final dish. To drain the pan of water, you can either use a spoon or you can put the cover on the pan and VERY CAREFULLY tip it over. You want to make sure that you always leave some water on the bottom so the chicken doesn't burn! Do this for about 30 mins or when chicken seems to be soft. Take flour and water in a mug and mix smooth. Add sour cream and mix. Once all smooth, pour over chicken and let cook for another couple of minutes. Also, don't forget all the extra sauce you have sitting in the mug on the side, be sure to pour that over the chicken when serving! Note: this is a sweet dish, but more than dessert. It works well to serve with a hearty soup or salad as the second and final course. Start boiling some water, in a medium-sized pan almost filled, but not quite. Mix the egg, farmer's cheese and farina in a bowl. Once it's well mixed, form little balls in your hand, about 1-1.5 inch in diameter. Once the water is boiling, place the balls in the water. Wait until they surface. They're ready to serve. Top the dairy balls - or let's call them dumplings - off with the following. Put the breadcrumbs in a frying pan with a little bit of oil and warm up few a few minutes while stirring. Then pour the crumbs over the dairy dumplings. Add sugar and sour cream/yoghurt as desired. And that's it. It is extremely easy. In fact, it's unbelievable that something so easy can taste so good. In a bowl, stir together egg with butter/margarine, milk and salt. Add flour, a little at a time, stirring well after each addition until the mixture is the consistency of a smooth dough. If it looks too thick, add a bit of water, but be careful with that. Vaníliás kifli (H, V) - vanilla cookies, often thought of as a holiday treat in Hungary, but tastes just as good at any time of the year. Don't bother with the chocolate though. I'm the last to ever say anything against chocolate, but this treat does not need it. Sprinkle with vanilla sugar powder instead! Beijinho de coco (coconut fudge candy) - this is a Brazilian super-sweet candy. It's fun to make, not hard but a bit labor intensive (not super labor-intensive, but your hands will get very greasy). Click images for bigger versions. 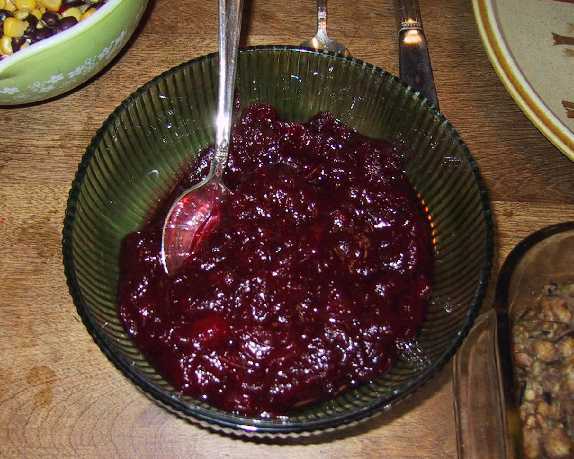 Cranberry Sauce (V, Q) - Dissolve a cup of sugar in one cup of orange juice. Add some lemon juice. Add one package (12 ounces) of fresh cranberries. 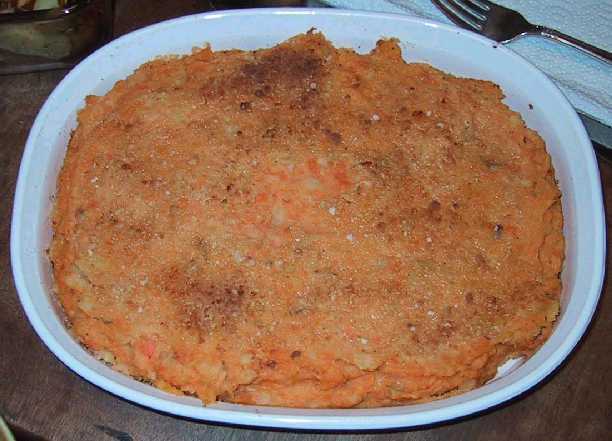 Rosemary Mashed Potatoes and Yams with Garlic and Parmesan (V) - from Allrecipes.com, a great way to put a twist on the usual mashed potatoes and sweet potatoes dish! 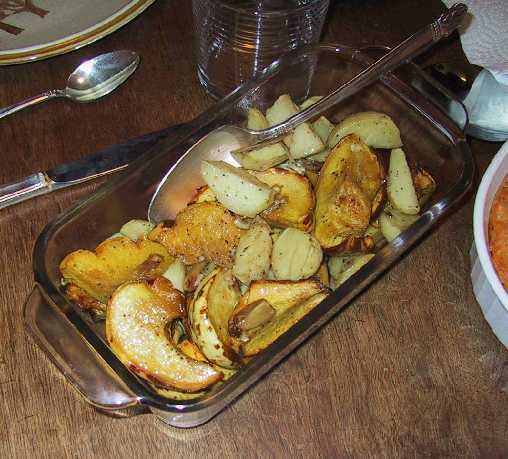 Roasted Squash with Potatoes and Garlic (V) [requires registration! :(] - from Wegman's, what used to be my favorite local supermarket when I lived in New Joysee (I'm waiting for them to find their way to Chicagoland). Modification in recipe: I did not have a large sprig rosemary so I substituted table blend seasoning for spices. I thought it turned out well. 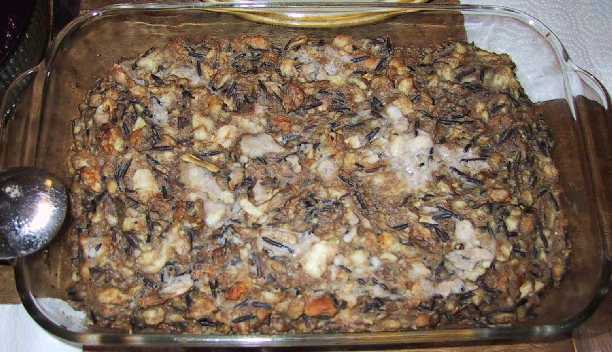 Vegetarian Stuffing (V)- from Allrecipes.com. The idea here was to make stuffing from scratch without having to rely on a turkey. This is a nice dish. I included all the optionals. One cautionary note: the wild rice made an otherwise smooth dish somewhat broken up so I don't recommend including that component. However, some other optionals I may include next time are dates, almonds and plums (thanks to my friend Alex for suggesting those). Better stuffing that I made up after getting helpful ideas from several friends. The recipe mentions chicken broth, feel free to substitute with veggie broth for a vegetarian version. 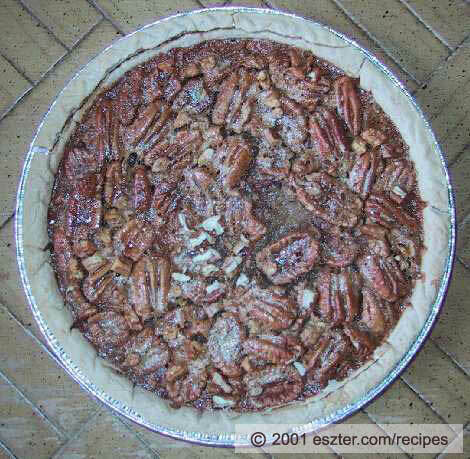 Janis Dohmann's Pecan Pie (V, (Q)) - a wonderful recipe, easy, and mmmm-good (this was my first pie ever) - note though that it can be just as successful without chopping up the pecans and simply using whole ones. And if you're starting out with whole pecans this will save you a lot of time. 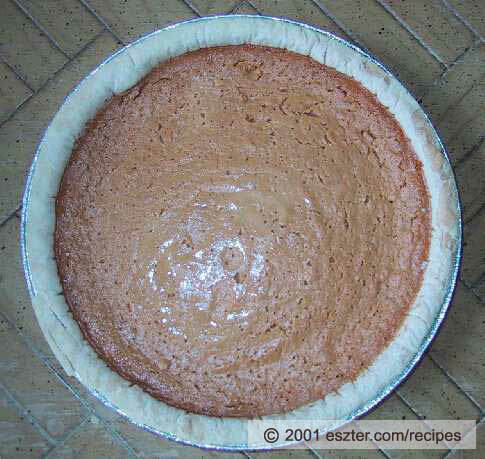 Fluffy pumpkin pie (V, (Q)) - from Allrecipes.com. I didn't used to like pumpkin pie but this was fun and easy to prepare and the innovative use of ice cream in the filling makes it yummy fluffy.